Much will be written in the coming days, both here and abroad on Mahinda Rajapaksa as he begins his second term as president. Though it is much too early in his leadership for scholars and commentators to make a historical assessment of President Rajapaksa’s place in post-independent Sri Lanka, snapshot journalism has provided some facets of the five years since he assumed the presidency. Whatever his critics and skeptics might say Mahinda Rajapaksa’s first term will be remembered in the annals of this country for orchestrating the decisive military defeat of the LTTE which many pundits here and elsewhere claimed was invincible in the battlefield. He was the architect of that victory for without his single-mindedness of purpose and political leadership bombs would still be exploding in Colombo and suicide bombers trying to wreak vengeance by the indiscriminate killing of the innocent of all communities. The LTTE would perhaps have still been around had it not thumbed its collective nose at the new president’s efforts to negotiate a settlement and tested his mettle with military attacks and forays that seriously affected civilian lives such as in Marvil Aru. Over the years Velupillai Prabhakaran made several strategic errors. None so grievous perhaps as relying too much on what he called the Mahavamsa mindset and not enough on the resolve of the people of Ruhuna where Mahinda Rajapaksa has his historical roots. When Mr Rajapaksa first became president he did not set out consciously to militarily defeat the LTTE. The decision was forced on him by a recalcitrant and over-confident Prabhakaran who deluded himself that the new president could be cowed into submission. Prabhakaran and the LTTE were to rue the day they decided to test the resolve of this son of the Ruhunu Rata. The huge electoral victories gained by President Rajapaksa and his government are sufficient testimony to the groundswell of popular support that endorsed his action against the LTTE. These victories were the Sri Lanka people’s riposte to those in the international community who urged that the Tiger leadership be spared while fighting their own war on terror by questionable means. President Rajapaksa’s own response was to tell the United Nations General Assembly two months ago that his responsibility as leader was to the entire nation, to the millions of people who make up the Sri Lankan nation. Having ended a debilitating war that held back development for decades what would be President Rajapaksa’s major task as he begins a second six-year term? This is being written before the president has spelled out to the nation the direction in which he hopes to take the country in the coming years. Without being privy to that information one could only try to glean his priorities from recent statements and from conversations I have had with Mr Rajapaksa over the years. One lengthy conversation was when he was Labour Minister and stopped over in Hong Kong where I was then working. He was on his way back from China and was staying at the Sheraton Hotel in Kowloon. He was very much in the background then under Chandrika Kumaratunga’s presidency. Even so he was not without ideas on how Sri Lanka should be developed and how workers’ rights should be safeguarded. But even more relevant were the conversations I have had with President Rajapaksa on politics, development, war and peace and the way ahead for Sri Lanka, during his several visits to London. I first met Mahinda Rajapaksa 40 years ago when I was Lobby Correspondent and later Parliamentary Editor of the Daily News and he had just entered parliament. The Daily News used to report parliament quite extensively and one of the tasks was to cover the Government Parliamentary Group meetings. Mahinda Rajapaksa was one of my regular sources of information for happenings at those meetings. Though he was the youngest MP in parliament then, he seemed to have an instinctive grasp of what a journalist wanted and while other MPs rambled on telling us about the goings on, the young parliamentarian from Beliatta was not only succinct but extremely approachable. It is that affability he then possessed that has also helped him through difficult days and has won over even those who have been his strongest critics. He has not lost that easy-going but self-confident approach and so when I asked him about devolution and development over lunch at High Commissioner Kshenuka Senewiratne’s residence in May 2007, he made a point that instantly took my mind back to the second half of the 1960s. I was one of the journalists regularly covering Prime Minister Dudley Senanayake’s visits to the various districts to inspect agricultural development work and later with Hector Kobbekaduwa when he was Minister of Agriculture and Lands in the SLFP-led coalition of the early 1970s. I remember young Mahinda Rajapaksa telling me over tea in the canteen of the old parliament by the sea that if agricultural development and indeed development was to be successful there must not only be national plans but district plans. I used to write a weekly column on agriculture for the Daily News and he was trying to explain the difficulties faced by the peasantry in the deep South even to sell their produce. That afternoon in London when our conversation turned to the unit of devolution he returned to the subject of the district. Development, he said, was best handled at the district-level rather than the provincial to be effective. It reinforced much of what I had gathered during travels with Prime Minister Senanayake and Minister Kobbekaduwa. President Rajapaksa’s priority in this second term I believe would be to take development that has for years been concentrated in a few districts with Colombo as the centre, to the North and the South. These provinces have remained largely neglected over the years for different reasons. They lie at the country’s extremities and are mainly populated by those of two different ethnic groups. These regions also gave rise to insurgencies. 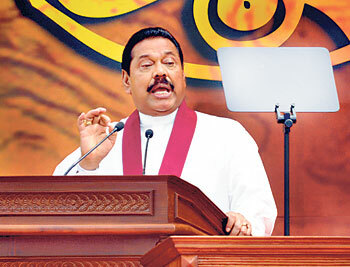 Deprivation and the lack of development were partly responsible for the uprisings and coming from the deep South President Rajapaksa is surely aware of this. His emphasis on infrastructure development as the main focus of the current development plan is not without point. Roads, power, communication are prerequisites for spreading development more evenly. Students of mass communication know only too well what changes are wrought in development when the means of communication are improved and modernity comes to the rural areas. My own belief is that President Rajapaksa’s second term will be characterized by a conscious and deliberate attempt at economic reforms that will bring development and prosperity to the smallest possible units. Sri Lanka can proudly say that it has achieved several of the Millennium Development Goals (MDGs). But these have been at the national level. Now is the time to bring these achievements to the district levels and lay the foundation for the new dawn that would make Sri Lanka’s economy one of the fastest growing in Asia and a sustainable one too. There is one other matter. If my conclusions drawn from these several conversations are correct, then President Rajapaksa’s interest in taking technology to the villages will see a concerted effort to make computer technology available to as many schools in remote areas as possible. The intention would be to make Sri Lanka a technology-driven modern society. Speaking in Singapore the other day the city state’s Deputy Prime Minister and Defence Minister Teo Chee Hean rated Sri Lanka as the second fastest growing economy in Asia. President Rajapaksa’s vision would be to make it the fastest growing nation in Asia before he completes his second term.